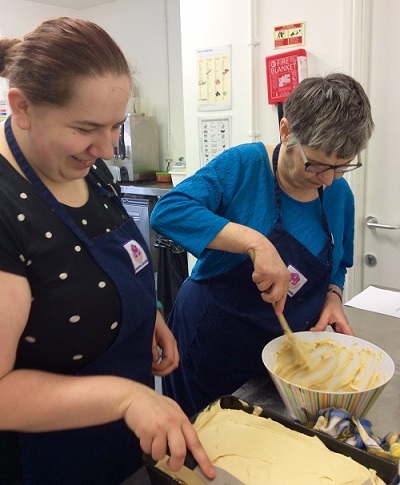 There’s been lots of variety at our Wednesday morning Skills Café sessions in May. First off, we had a full day’s training on Food Hygiene, which lots of our kitchen volunteers and some of the Manna House staff took part in, and everyone passed with flying colours to get their certificates at the end of the day. Then we said Goodbye to Beige Buffets as our Head Chef Nela showed us how to make mouth-wateringly colourful party food – all healthy and delicious, too, of course. And then last week we headed off to the old Manna House garden on Fellside to collect our garden tools ready for creating a brand new garden for the whole Manna House family to enjoy at our new premises on Ann Street – starting in the autumn, we hope! Drop in this week for more top finanical tips from Stacey our Community Banker.